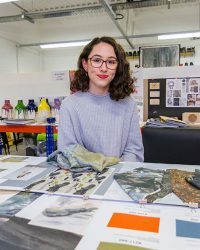 The future is bright for Yasemin Yasar, a Decorative Arts Student student from Nottingham Trent University who took first place a the UK final of the International Design Competition on Friday 27th April. The judging was held in York during our annual Day of Celebration and Yasemin was announced as the winner after the glittering celebration dinner in the evening. Five finalists from regions across the UK took part to compete for the opportunity to represent the UK at the next stage of the competition, the Grand Final in November. There can only be one winner however, and Yasemin’s design ‘Natural Land(e)scape’ inspired by her emotional connection to the Peak District’s flora and fauna was praised by the judges for its ‘simply wonderful, on trend, natural palette from the Color Atlas by Archroma®’ . Yasemin’s “highly commercial designs” narrowly beat runner up Laura Trowsdale, (North of England finalist) to first place. Laura, a BSc Textile Practice student from the University of Huddersfield impressed the judges with her entry, ‘Ombre Fascination’ for its “exciting colour palette and huge potential”. Congratulations to Yasemin and well done to all our talented finalists who each presented their winning deisgns to our panel of industry expert judges. A special thank you to our panel who enjoyed ‘a great day’ and praised the ‘incredibly high standard of entries’. Yasemin will join fashion and textile undergraduates from 14 countries at the Grand Final in November. Images of some of the entries and participants from the UK regional heats feature on our new Instagram site ‘sdccolour’.